Earthy & energizing, this blend brings clarity and awareness with a medium effect. There is something very earthy about this blend; it almost has a slight tobacco flavor. Red Raspberry, Mullein, Ginkgo Biloba, Gotu Kola, Damiana, Mugwort, Lavender, Mate, Calamus, Lobelia and Skullcap. 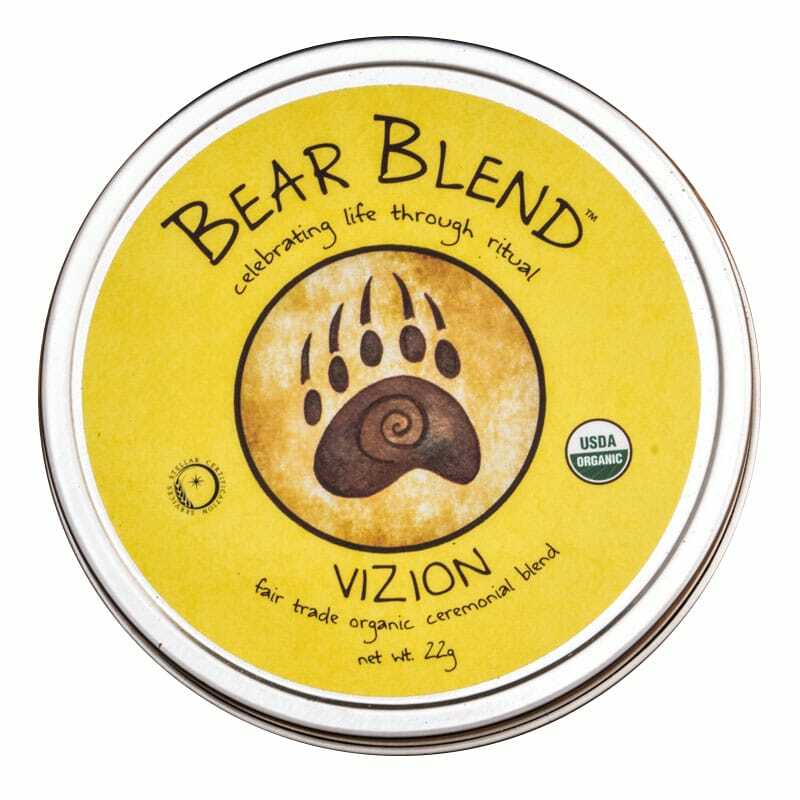 This is an amazing product, Bear Blend you are incredible! Had it at friends place and was just the best additive for a joint. The Vizion blend is terrific. It smells amazing and makes a pleasant smoke. When I smoke it I feel energized and chilled out at the same time. The herbs are so fluffy. Love this product! Okay, so I don’t ever leave reviews but this is well worth it. This review is for the loose blend (ceremonial blend) Vizion. First off, let me just say that this blend is SO FLUFFY. Omg. I was honestly in love at first sight, hadn’t even tried it yet. The smell is another plus. I actually received my package unexpectedly on a Sunday and I’m not complaining about that one bit. It came quicker than expected as well. This blend vapes extremely well. The taste is pretty amazing too. Super smooth and again, the scent is super captivating. I just ordered the trifecta (Dream Lodge, Amazon and Kin Nik Nik) and will be leaving another review once I get them. I also ordered the Dream lodge (coconut), moon and vizion all in an e-liquid to use in my second liquid vape. For anyone on the fence about this product, I say go for it. It’s a great and healthier alternative to meds. For a person like me who’s trying to migrate from meds to holistic/herbal medicine, this is a dream come true. I’ve been recommending this product to everyone I know! Thank you Bear Blend! I ordered the tin of Vizion and a tin of Dream Lodge Rolliez. I absolutely love them both but I think I may stick with the loose herbs so I can roll my own. I have already finished the dream lodge but I have been using the tin of Vizion and I’m amazed of how it tastes so awesome and looks really fluffy. The feeling relaxes me like taking a muscle relaxer. It’s puts me to sleep every night. Definitely earned my business and will be a long time customer. Will get the trifecta next time. Will get dream lodge, Vizion and want to try kin nik nik. I vape vision in a davinci iq and the taste is amazing. I vaped it from 360 – 390 and it produces a good focused effect. Also mix it with some cannabis and you are in for a floaty head type of high. Great product, shipping has definitely been great since the second order.No issues with rolling it to smoke or the consistency of the product quality.Great alternative to prohibited herbals or of trying to quit cigarettes.Will continue to do business with this brand. Just give them a shot! Moon blend tea is a must. Thank you brothers! Received it as a Birthday gift. Never felt more at ease & just relaxed . Definitely ordering more for myself.